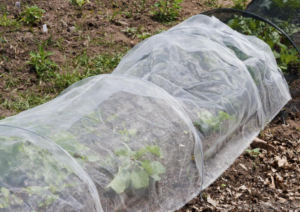 When temperatures drop down to the low 30s and below its a good idea to use frost cloth to protect plants from winter frost. Foreman’s General Store has you covered with plenty of frost cloths available now in-store. Stop by the garden section and inquire about how you can protect your plants before the big freeze. It’s important to know how plants can develop frost damage in order to prevent plant death. When water expands and freezes inside a plant cell, it will expand and bust the cell wall and the plant dies. As the plant thaws, you will notice the effects of the frost that includes, limp leaves and branches, black tips on leaves. The most common plants that need protection are tropical plants, ferns, citrus, succulents, and cactus. Make sure you choose the proper frost cloth to protect your plants. Frost cloths are a woven fabric that retains warmth and allows light and air to penetrate through. Be sure to use frost cloth that is made for plants. Do not use plastic, sheets, towels, or blankets which can cause more damage. Drape the plant from top to bottom, letting the cloth touch the ground. Cover plants with the cloth before dusk to capture radiant heat. Seal the cloth to the ground to ensure that it traps the radiant heat. Use bricks or frost fabric staples. Make sure there are no openings that will allow the warm air to escape. This entry was posted on Wednesday, January 16th, 2019 at 12:10 am	and is filed under Garden, News & Updates. You can follow any responses to this entry through the RSS 2.0 feed. Both comments and pings are currently closed.